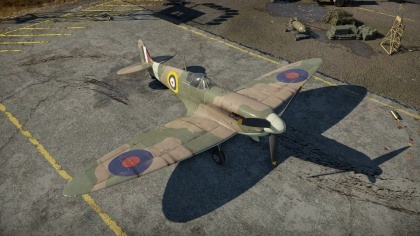 The Spitfire Mk IIa is a Rank II British fighter with a battle rating of 2.7 (AB/RB) and 3.0 (SB). It was introduced in Update 1.35. 4 mm Steel plate in pilot's seat. It is faster than Japanese planes, so if attacked by one, either use a Rolling Scissors technique or just fly away and if in a good position, Boom & Zoom it. Eight 7.7 mm machine guns provide great anti-fighter power. Good roll rate at low speed. Better engine power than Mk Ia. Decent amount of armour, a front 38 mm glass and rear 4-7 mm steel plates. Machine guns only effective if target is hit in continuous bursts. Machine gun armament lacks the long range hitting power of cannons. Ammo can run out quickly in prolonged, uncontrolled bursts. Quick kills against large bombers without a pilot snipe is difficult, prolonged engagements exposes the Spitfire to the defensive gunners. Machine guns cannot penetrate heavily amoured targets. Roll rate stiffens dramatically at ~350 km/h. Pulling negative G's and rolling the plane (Realistic/simulator only) can cause the carburetor(engine) to fail. 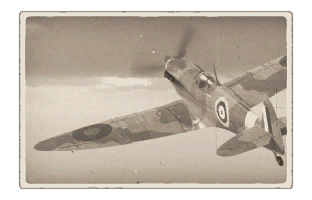 Skins and camouflages for the Spitfire Mk.IIa from live.warthunder.com. This page was last edited on 2 February 2019, at 21:53.